A hard-fought victory over a plucky international challenger and the callous betrayal of a close friend saw Valkyrie’s dominance of SHINE remain strong, despite a few minor setbacks on the way. SHINE Champion Rain faced a new test in the main event as she defended her title against Japanese star Hiroyo Matsumoto. Because of the consistently high standards of SHINE undercards, the promotion’s main events (while always good) are rarely the match of the night, but Matsumoto’s energetic and aggressive performance combined with a superb outing from Rain and a host of nailbiting moments that defied the predictable nature of the result (that backdrop driver spot!) secured this match’s place as the standout contest of the show, with Rain landing her patented implant DDT to ensure that the last few months before her imminent retirement will be very interesting indeed. And won’t they just? Immediately after the match SHINE commentator and makeshift announcer Lenny Leonard revealed that Rain’s next challenger had already been signed for the next show on December 13th, and brought out All Star Squad manager Daffney, who presented Amazing Kong as her new recruit, and very possibly the next SHINE Champion! Valkyrie’s outreach extended throughout the undercard as usual, with Allysin Kay and Ivelisse teaming up to challenge the fun-loving international duo of the Global Green Gangsters (Kellie Skater and Tomoka Nakagawa) for the SHIMMER Tag Team Championships in another fantastic match that saw all four incredibly talented women impress as expected, with Nakagawa and Ivelisse particularly starring on either side. After Kay and Ivelisse’s defeat, which saw Kay get pinned by Nakagawa following a tandem kick combo from 3G, Jessicka Havok came to the ring to confront her best friend Kay, issuing her with a “Valkyrie or me” ultimatum – which it seemed like Kay accepted, embracing Havok and leaving her stablemates…for a while. Indeed, thirty-two minutes later the reunion was cancelled in unapologetic fashion during Havok’s Last Woman Standing match against Saraya Knight. After a barrage of lethal chair shots, vicious groin kicks and goodness knows what else (and yeah, the occasional accidental attempt at a pin by Saraya despite the stipulation, but whatever) followed by a tombstone piledriver onto the bar (!) from Havok to Saraya, The ‘Havok Death Machine’ looked set to have clinched this one, but for a clothesline out of nowhere by Kay, allowing Saraya to get up and beat the ten-count, coming out victorious. Valkyrie continued the assault on Havok after the match, sowing the seeds for a lengthy feud between these two friends-turned-enemies. Outside of Valkyrie’s shenanigans, Amazing Kong wrestled Madison Eagles in an excellent, hard-hitting bout that saw Kong pick up the win with a second-rope diving splash. Since her recent reinvention Kong has had a new lease of life in her matches, showing a new-found agility and flexibility that is making her better in the ring than ever before, while Eagles continues to show just why she’s one of the best female wrestlers on the planet. Scotland’s Nikki Storm is normally the kind of talent that could wrestle a wet mop and still steal the show, but while her usual charisma was there last night her match against Nikki Roxx didn’t quite live up to the lofty expectations I had for it. It wasn’t bad, by any means – but it was sloppy and hard to get into at times, always feeling as if it was about to burst into life, but never quite making it. There were good moments in the match though – particularly Storm kicking out of the Barbie Crusher and getting the win thanks to interference from Mercedes Martinez – and Storm can hold her head up high following an extremely impressive US tour that has certainly got the whole women’s wrestling community in America talking about her. Meanwhile, Mia Yim‘s phenomenal wave of momentum just keeps growing and growing, putting on an incredible performance in her three-way match against Shanna and Savannah Summers. From a double half-crab on her two opponents, to a double suplex, to taking a winding double-stomp to the midsection in a spot of cooperation by her opponents, to finishing Summers off with a deadly Package Piledriver, Yim’s energy in the ring is simply a joy to watch, and if I were a betting man, I’d expect to see her somewhere very close to the SHINE Championship picture very soon indeed. 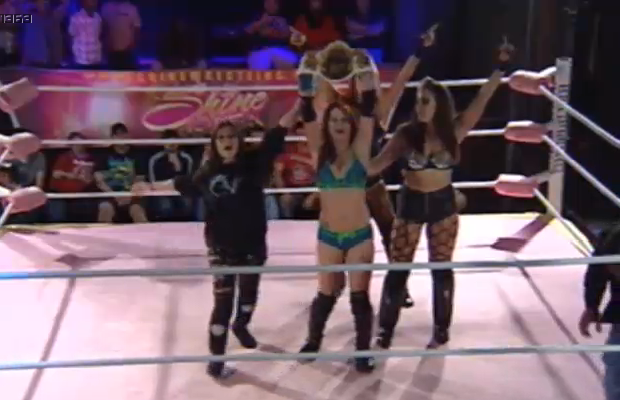 Also, Kimberly looks like she might be another new addition to the All-Star Squad, seeming to impress Daffney in her countout victory against Mercedes Martinez, which Martinez walked out of halfway through due to a disparity in numbers. Kimberly didn’t seem to mind – they all count! Elsewhere on the card, the SNS Express continue to turn many heads with their performances with a great winning effort against the American Sweethearts (Santana Garrett and Amber O’Neal) and Leva Bates, who this time was dressed as Pyramid Head from Silent Hill (not gonna lie, I have no idea what that means). Like most six-person tag matches it was difficult to follow at times but some nice spots and good teamwork from all parties involved made for a highly entertaining contest. Finally, Solo Darling opened the show in colourful fashion, dressing as “Shark Solo” for her match against Su Yung, a short but fun bout which saw Solo roll Yung up for the three-count following some ‘Jaws’-style shenanigans outside and under the ring. As entertaining as that was, however, it’s a shame to see a talented rising star like Su Yung relegated to the opening spot on the card yet again, and I can only hope she doesn’t get even more lost in the shuffle over the coming months. All in all, however, this was one of SHINE’s best shows yet, with a fantastic main event backed up by a solid and well-booked undercard, with plenty to ponder over the November break before the final show of the year in December. Jessicka Havok and Allysin Kay’s inevitable grudge feud looks to be setting itself up very nicely indeed, while the expansion of the All-Star Squad means Valkyrie could be facing some serious competition on the stable front, particularly with Kong as Rain’s next opponent. SHINE have been brilliant at surprising us since they began, and I can’t wait to see what they do next. Roll on SHINE 15!